Nouveau chalet rénové et confortable avec piscine et grand jardin. Situé à 25/30 minutes à pied du centre-ville mais à 5 minutes de l'arrêt de tram le plus proche, la maison dispose de deux chambres doubles et deux salles de bains, l'un d'eux en suite. Grand salon et salle à manger avec cuisine ouverte. Tout se connecter à la zone à l'extérieur où il ya une belle piscine, un barbecue et une terrasse couverte où se détendre. Orientation sud si ensoleillé, calme et très privé. Disponible toute l'année. Whilst the property is "remote" it is still strangely in the middle of everything you need.The main town of Soller a short walk one way, the port and beach another and mountain walks or drives everywhere. Or just stay put and enjoy the cool pool.We have stayed here twice before and will hopefully stay again. Thank you for your feedback! Happy to welcome you back again soon. Wir haben in Juans Haus eine sehr erholsame und schöne Urlaubswoche genossen. Wunderbar ruhig gelegen und trotzdem nahe genug am Strand in d'en relic und Puerto Soller. Unsere Kinder hatten eine große Freude mit dem Pool, wir mit dem herrlichen Panorama. Thank you for your feedback and happy to welcome you again!! We loved our time at the villa and would 100% recommend it to friends. The villa was finished to a high standard and was equipped with literally everything you could need. The pool area is fantastic and the outdoor shaded building was ideal to sit under to eat or just get out of the sun for a bit. It was also a great place to sit in the evening reading or drawing, listening to music with a beer or some wine. It is such a peaceful area that outside at night you can hear local wildlife - we think we identified the unique sounds of Scops owls and midwife toads! The views are spectacular and the proximity to the tram, Sóller and Port de Sóller make the location ideal. We really appreciated the oranges that were left for us from the grove and used the electric juicer every day. The best orange juice you could ever taste. We also made some lemonade from a few of the lemons around about. We are a family for 4, our two girls aged 5 and 13 absolutely loved it and we hope to return. Thank you for your comments and hope to wellcome you again in a near future! 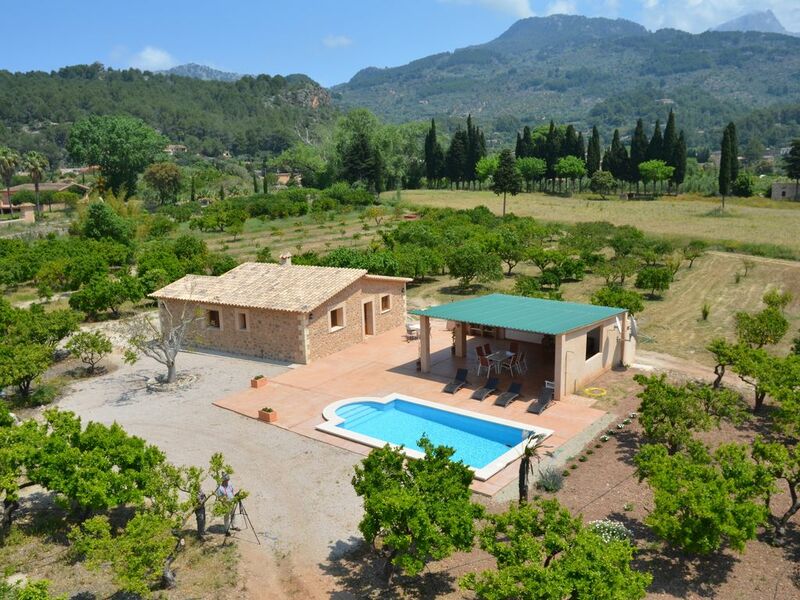 einfach T R A U M H A F T.
A fabulous villa and location set amongst orange and lemon groves. Perfectly located for Port Soller and Soller. We enjoyed the villa so much we have booked it again for next year! Thank you for your comments. I am very pleased that you had a great time and look forward to welcoming you again next year! A lovely modern villa in a quiet area with amazing views. We had a great family holiday in this lovely villa. It was so peaceful amongst the orange and lemon trees and great views of the surrounding area. Alot of outside space and very welcoming pool. We used the tram to take us into Soller and Port Soller as it was only a 5 minute walk to the tram. Thank you for your feedback. Very good to see that you enjoyed your holidays and hope to welcome you again in the future! Le port est à 25 minutes à pied, le même que le centre ville. Le tramway local passe à proximité de la propriété, donc en moins de 5 minutes, on peut prendre le tramway pour aller au port ou jusqu'au centre-ville.